"Home of Tony's Original One Pound BLT!" 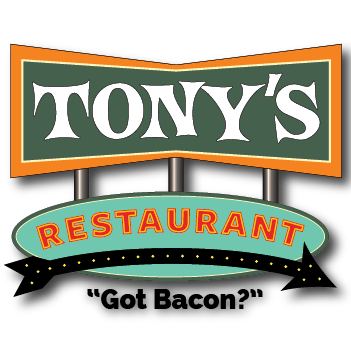 Tonys has been run for 68 years in the Saginaw area. In 1973, the restaurant moved from Weadock Street in Saginaw, to its present location in Birch Run. The restaurant was small, only able to seat 60 people, in its one small dining room. Now, thanks to the patronage of our many regular customers and tourists, we are able to seat 200 people in our three dining rooms. We have become known far and wide for our large portions of food and fast service for people on the go. The employees informal friendliness makes your feel at home with the sassy joking waitress, and the busy cooks who take the time to wave across the room at the customers they know. The old world atmosphere is complete with shelves of Italian peppers, spices, and salami sticks hanging from the ceilings, making a festive place to dine. We have succeeded in offering a large variety of food on our menu. From sanwiches, steaks, seafoods and Italian dishes, to breakfast anytime. Because of our large volume buying, we are able to offer these big portions at a fair and reasonable price. We do not try to be fancy Our sandwiches are served on Thickly sliced bread. Our dinners are served on large platters piled high with freshly cooked food. Our huge breakfast, complete with home strawberry jam, is a pleasant start for the travelers' day. Our super sized desserts have become as famous as our meals. Towering sundaes, large slabs of pie, and awesome banana splits, have caused many an outburst of laughter from our customers who surprise their friends.